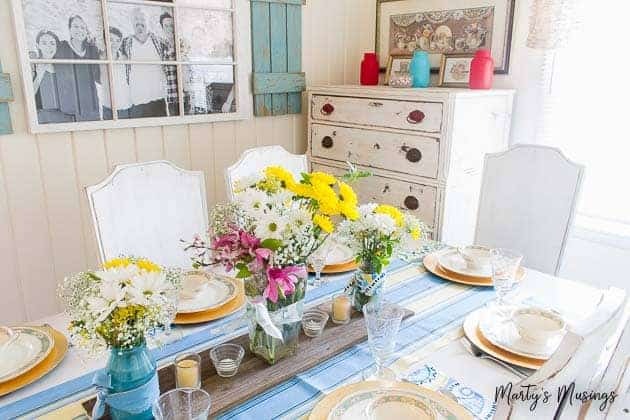 You can decorate your home quickly and easily with these 3 easy and cheap summer decorating ideas by using bright colors, coastal accessories, and plants and flowers to enjoy. I know it’s almost the end of summer but here in North Carolina the hot weather is here to stay for several more weeks! Even though I long for fall the truth is I need a dose of creativity to get me through summer and I thought you might, too. 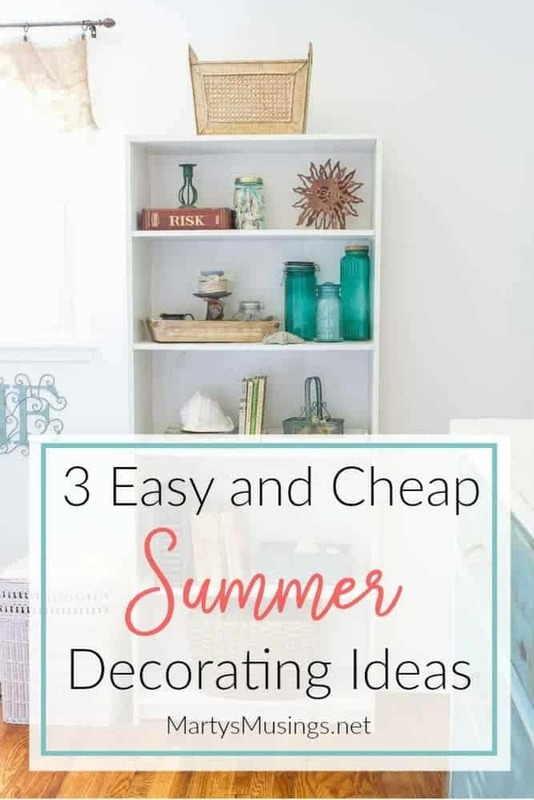 Since I’m all about budget decorating to create a home I love I rounded up some of my best easy and cheap summer decorating ideas. That means looking for ways to incorporate new fabrics, accessories and colors into my home. Winter decorating tends to be more subdued with an emphasis on neutral colors for cuddling up on the couch and staying indoors. Summer is all about entertaining and enjoying good food with good friends. One of the easiest ways to make the transition to summer is to use bright colors. Add some new throw pillows, removable slip covers or a bold throw for starters. I love florals as well and you can incorporate traditional patterns or go a little more contemporary. Don’t be afraid to mix and match patterns but stay with a common color scheme to help the styles coordinate together. My new living room/kitchen open space is neutral with a pop of coral and aqua, perfect for summer. Think about possibly purchasing removable slip covers for furniture. (I really want to do this in our new space but I haven’t convinced my husband to take the plunge yet!) The ease of cleaning may offset the price if your family includes small children. Then you can use the slip covers through other seasons and just change out the pillows and throws. If you use draperies in the winter switch to sheers or valances in the summer for a lighter look. Don’t overlook other areas of your home. 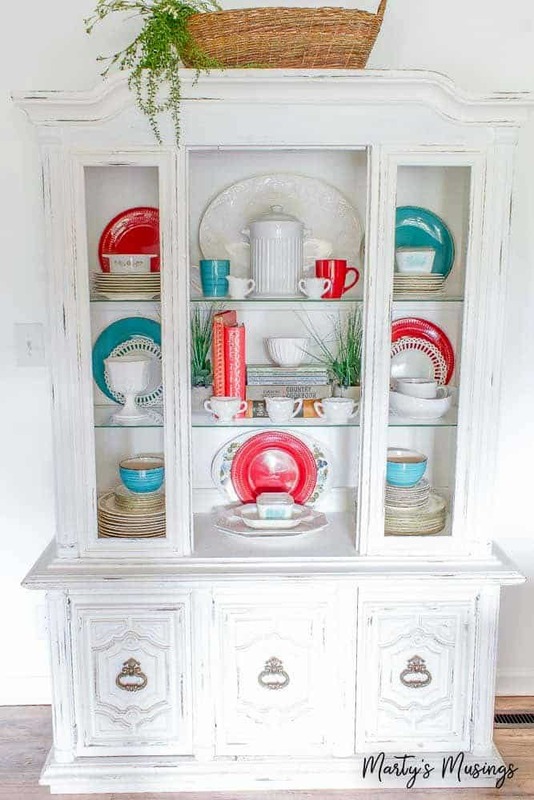 Look how bright my chalk painted hutch looks with just a few dishes in red and teal. My china is still stored here with neutral whites but just a little color makes me so happy! 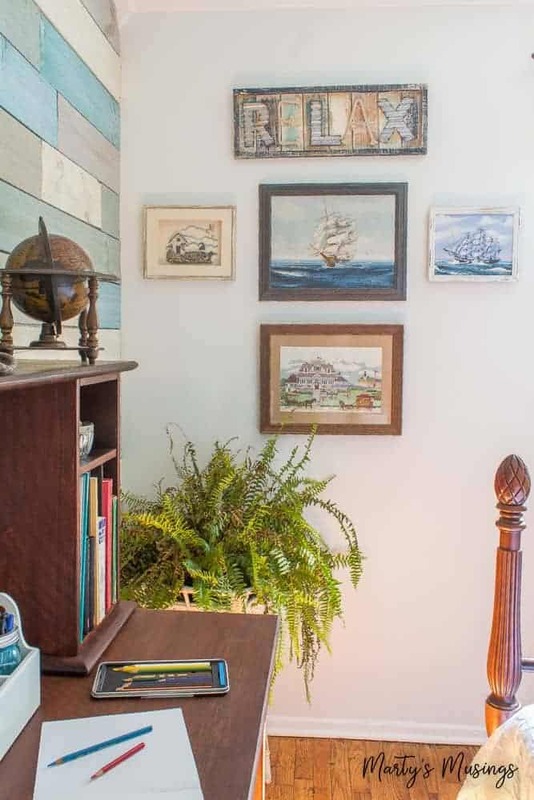 The coastal or nautical style is always a hit for summer decor. One of the easiest ways to incorporate this is through the use of shells. If possible, don’t spend money on these! They are free for the taking at any local beach or just ask your friends with children! When we go on a beach vacation I have my kids hunt for the biggest ones they can find and use them in glass jars or in vignettes. The shells bring a little bit of the beach home with us. 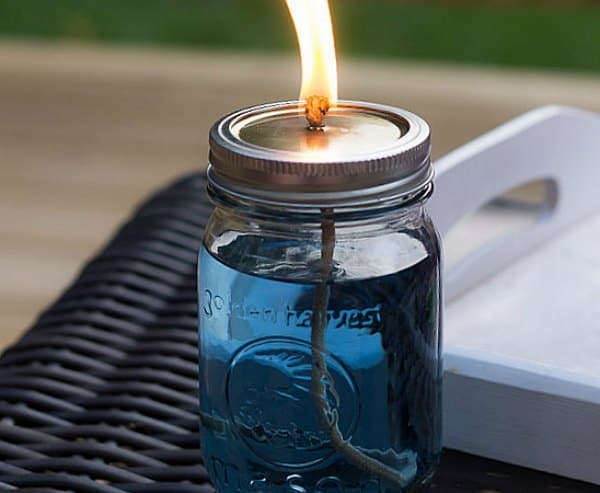 Some sand added to a mason jar with a tea light candle will bring a bit of the coastal touch to any room as well. 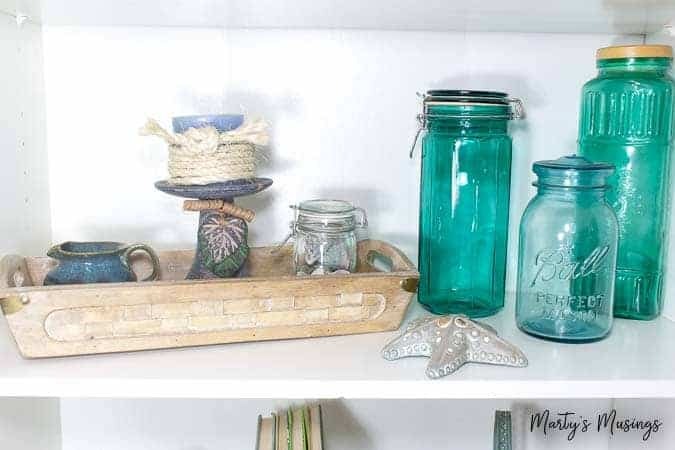 Notice the use of aqua colored mason jars for a relaxing feel to the vignette. Mason jars are good for outdoor entertaining as well. Use one with citronella liquid in it for both a cute and effective bug deterrent. Summer is the time to let your green thumb shine! I don’t have much of one but I do love flowers outside in the summer. Yes, they require some upkeep but their beautiful display of colors is worth it! You don’t have to have a ton of outdoor space on your patio, porch or deck but summer is the perfect time for nurturing a few plants. Also, don’t forget to clip flowers for centerpieces and arrangements for your table. Living plants can also decorate the indoors of your home. Use non traditional containers like a watering can or paint a terra cotta pot. I stacked this fern on top of a board for height inside a $1 yard sale shabby chic stand. 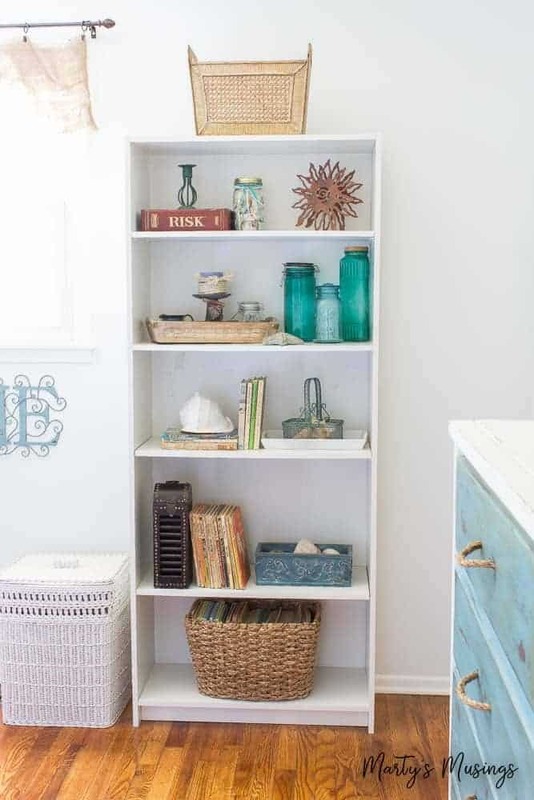 What are your favorite summer decorating ideas? 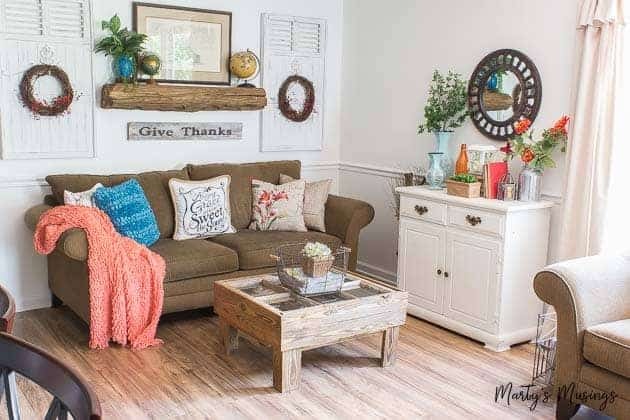 You can see more ways I create a treasured home with simple thrifty decor in these posts: 13 DIY Rustic Home Decor Projects, Top 10 Yard Sale Bargains and 5 Organization Ideas for Small Spaces. 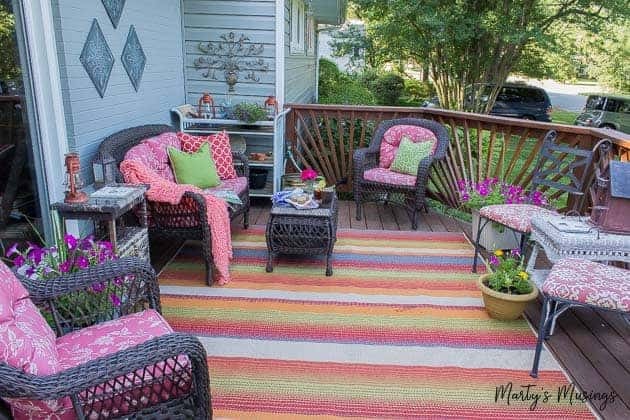 I love the rug on the deck. It reminds me of a bouquet of flowers! Marty, did you make or buy the shutters in the dining area? Hi, Diana. Good to hear from you! Tim actually made the shutters and I just updated that post. You can read it here: https://www.martysmusings.net/2013/05/old-window-photo-frame.html Have a great day!